As part of our celebration of Women’s History Month, The Albert M. Greenfield Digital Center for the History of Women’s Education is featuring content from The Woman’s Column, a pro-suffrage publication from the late nineteenth and early twentieth centuries. Bryn Mawr College Special Collections recently acquired a large holding of print copies of the Column, and we will be blogging about articles and findings from the newsletter every week during March. This post is the second installment in that series; check out our first post on this amazing newsletter here. Alongside the general news updates on suffrage activity and women’s rights, The Woman’s Column regularly published short opinion pieces and commentary responding to specific remarks made by public figures or commonly held opinions of the day. This post highlights an article which illustrates some of the interesting cultural shifts that were taking place at the end of the nineteenth century. “If so,” the author comments sardonically, “it is odd that they should so often be chosen as college presidents.” This pithy article, published on March 11th, 1899, is a mark of the incredible pace of changing ideas at the dawn of the twentieth century about what was best for women and what they were capable of. 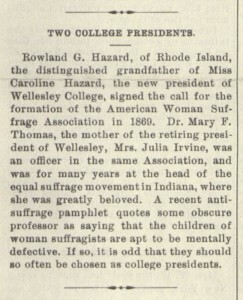 The reference to Wellesley in the article mentioned above therefore suggests that by 1899 a surprisingly advanced shift had taken place in the status of women’s colleges in the public view. It is, of course, expected that a publication dedicated to equal suffrage rights would be in support of equal education as well (as we explored in our previous post), and opinions published in The Woman’s Column should not be taken as a broadly representative of public perspectives2. However, the article boldly implies that the opinion of this “obscure professor” is universally discredited based on the evidence that the children of suffragists are not, in fact “mentally defective.” Only two decades after the public vocally doubted that women could physically survive a college education, affiliation with an institution of women’s higher learning was being used to validate the reputation of the individual, and to lend credit to the suffrage movement as a whole by association. Women’s higher education had become stable and respectable enough, in the eyes of many, to shoulder the weight of bolstering another movement that was receiving scrutiny. In some ways, however, the landscape had not changed very much at all since Edward Clarke’s gloomy prophesies of thirty years before: the points of the debate still centered around parental lineage and the effects of radical ideas upon future generations. The arguments against women’s education in the mid-nineteenth century were often motivated by anxiety over women’s reproductive habits and abilities: the crux of the anti-education stance was that education would inhibit reproduction, either by causing stress that could physically wither women’s reproductive organs (see Clarke, Smith), or by diminishing their interest in marriage and child-rearing. The arguments boiled down to a single point: whatever dangerous consequences education held for women could trigger a magnified ripple-effect upon the race as a whole. Education proponents also leveraged this idea: a more popular and persuasive alternative to arguing that women should be able to access education for their own sake was the notion that education could improve a woman’s ability to perform her familial and maternal duties. As a companion to her husband, a keeper of a household, and a mother and teacher to her children, women’s ability to enhance the lives of those around her could be furthered by some measure of education. This line of thinking is well documented in publications such as The Ladies’ Companion and The Ladies’ Garland, monthly magazines that were considered proper reading for respectable middle-class women. 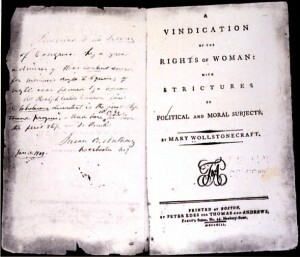 Mary Wollstonecraft famously argued this position in 1792 in A Vindication of the Rights of Woman: With Strictures on Political and Moral Subjects, a work that is widely considered to be the first feminist treatise (a first edition of Vindication, and several ladies’ periodicals like the ones referenced above, are featured texts in our exhibition Taking Her Place). As a compromise between the radical ideal of education for the sake of intellectual development and the conservative conviction that women were not fit to be educated at all, it was palatable to both sides to argue that women’s education should hinge on their role as mothers and wives. It was through these roles that they wielded their influence: under-educated mothers might not be prepared to instill essential knowledge and moral values into their children, and it was ultimately for the benefit of those children (especially the sons) that women should be educated. Though shorter and less substantial than many of the other pieces of writing published in The Woman’s Column and its sister publication, The Woman’s Journal, brief articles such as this one help to illustrate the intricacies of a monumental shift in the public view of women’s proper role and her scope of power. Next week this train of thought will be continued with another short article from The Column that references and provides an interesting twist on some of the same cultural beliefs discussed in this post. Watch this space for the next installment! 1. LMN, “Speech for ’79 and the Trustees at Semi-Centennial,” 2, Unprocessed LMN Papers, WCA; also LMN, “A Wellesley Retrospect,” WAM 14, No. 2 (Dec. 1929): 54-56. This entry was posted in News by Evan McGonagill. Bookmark the permalink.